Adam Syed on Fri, 07/24/2009 - 11:10pm. Yesterday I was listening to Alex Jones. He and his guest seem to think the NWO boys are pulling out all the stops and it isn't working for them. Too many people are wise to what is happening. Even the police and the armed forces. The thing that scares me the most is that when a wounded animal is cornered he is the most dangerous. 9-11 Joe on Sat, 07/25/2009 - 10:41am. With the police and armed forces on your side, to whom do "they" turn for protection or support? The wounded animal is rendered impotent without this support. Phaedrus on Sun, 07/26/2009 - 6:27pm. but lets not forget Backwater and foreign troops. Personally I am going to arm myself. I hope I never have to use a gun but if my family is threatened I wouldn't hesitate. Remember our founding fathers gave us the right to bear arms precisely for this reason. An out of control government like the one we have now. 9-11 Joe on Mon, 07/27/2009 - 12:39pm. YOWZA !!! You guys ROCK!!! I will try to lean on our group to lean on the bay area public stations to follow suit. Thanks again for leading the way on this! LeftWright on Fri, 07/24/2009 - 11:50pm. Freedom to Fascism, 911 Press for Truth, 911: Blueprint for Truth......Unbelievable progress. sewalkie on Sat, 07/25/2009 - 12:12am. This is great news. But KBDI is but one the many PBS affiliates across the entire US. Shari Bernson, as Executive Producer, most surely has regular contact with the higher-ups at PBS headquarters. She took the risk of programming 9/11-related shows at her outlet in Colorado and given the overwhelmingly positive response they've gotten, she continues to air them. This is huge, but someone who has direct contact with her within 9/11 Truth should ask her to suggest similar programming at the national PBS level. Why not suggest a nationwide PBS 9/11 Day on Sept 11, 2009....back to back documentaries, interviews with major personalities from 9/11 Truth... It's worth a try. Nothing ventured, nothing gained. Look how far we've come this year. milongal on Sat, 07/25/2009 - 3:49am. zombie bill hicks on Sat, 07/25/2009 - 11:16am. A mainstream TV broadcast advocating the apparent CD of the WTC - unprecedented in the U.S.? Aidan Monaghan on Sat, 07/25/2009 - 4:34am. Who knew we would have to broadcast the messages of freedom and truth into this country like the old US did in broadcasting Radio Free Europe. rebel patriot on Sat, 07/25/2009 - 9:26am. A Major Breakthrough ! So true! This carves a path, sets a precendent. History is being made. TomT on Sat, 07/25/2009 - 6:34am. Bring R Gage and S Jones to the studio! Joe on Sat, 07/25/2009 - 6:42am. It'd be cool if Prof Jones & Ryan were there too!! It looks like Richard will be there. From above: "...the evening of August 15 at Five Points Media Center. Members of Colorado 9-11 Visibility will be on hand to answer phones and Richard Gage will be in the studio for interviews during the fund raising breaks...."
TomT on Sat, 07/25/2009 - 8:27am. are being considered to join Richard on the 15th. No decisions have been made yet that I am aware of. Suggestions from CO911V about the premium gifts (books and DVD's) are under consideration and final decisions yet to be made by the station. Michael on Sat, 07/25/2009 - 10:46am. Discussion Of The Nano-Thermite Evidence On Air? Discussion of the nano-thermite evidence on air by the proposed guests would be a fantastic breakthrough. Aidan Monaghan on Sat, 07/25/2009 - 4:25pm. I am positive this will happen, if I have to do it myself. During the showing of Press for Truth, Earl Staelin who is one of our members got on camera as a rep from Colorado 911 Visibility and was able to mention the paper on nano-thermite. We have all this on video that the general 9-11 movement has not seen yet. The June 3rd fund raiser on KBDI was actually 3 hours long, but the film itself is only 87 minutes. The entire rest of that time was involving interviews with Bob, Kyle, Ray, and a couple of our CO911Vis members. This added up to well over an hour of on air stuff besides the program itself. Yes, there was fund raising going on during that time, BUT, for the most part it was straight up interviews with our people. It was amazing. Being on the phone bank, I was for the most part unable to pay much attention to what was going on for the camera because we were swamped with phone calls and pledges. Jason Charles from Truth Alliance has the raw footage and will hopefully be getting it out to google video or youtube soon. I have been pushing for this because I think it's important to have out there and I don't think most people realize just HOW MUCH TIME 9-11 TRUTH GOT that night. As I said before, Earl did get the new paper mentioned and I am very confident that it will get mentioned this time as well. Michael on Sun, 07/26/2009 - 9:50am. Look forward to any vids. Any future possible appearances by SJ and KR would be a major coup. Would be great too see similar efforts in other PBS markets. Aidan Monaghan on Sun, 07/26/2009 - 10:32pm. I may just have to move out to Colorado if this location is as 9-11 truth friendly as this station is. rebel patriot on Sat, 07/25/2009 - 9:22am. I have a friend in Colorado who couldn't deal with 911 truth but recently she asked me about it and I sent her an email telling her all about the Convention in DC and Richard Gage and the CIT. I told her that steel buildings don't blow up and then fall down. It just doesn't happen. She sent me an email a couple days ago and said she is really doubting the OCT now. This is a breakthrough because of all the people she knows. Colorado is in the House!! BreezyinVA on Sat, 07/25/2009 - 10:59am. Thank you Michael and everyone at Colorado 9-11 Visibility! You are setting a wonderful example for all of us to try and follow. Cincy911Truth on Sat, 07/25/2009 - 11:32am. I was back visiting my family in Colorado this past month when my my sister and I turned the television to 9/11 PRESS FOR TRUTH being aired, around July 10, during prime-time on Colorado public television. My parents called us from the other side of the state, stunned and deeply heartened that 9/11 Truth was seeing more light than any of us had expected that it would on a major news outlet. (KBDI is viewed not only all over Colorado, but throughout much of Nebraska Wyoming, as well as parts of New Mexico and Utah too.) It was a profound, no-holds-barred evening of viewing, with powerful personal testimony and presentations from Kyle Hence, Bob McIlvaine and others. The hosts at KBDI could not have been more respectful, genial and professional. Among the items available to donors to the station were books by David Ray Griffin, and the recent peer-reviewed article about the discovery of Thermite/Thermate in the WTC dust was mentioned. A real coup in public relations for 9/11 TRUTH! Congratulations and profound thanks to all those involved! Bravo, Mr. Wolsey! Please, PLEASE let Colorado Public TV know how much the risks they are taking to bring out the truth are appreciated by us, and donate to them if you are at all able... It's clear from some of the messages the station received that they were taking some real flack for this. We need to speak up in support of KBDI and their strong commitment to real journalism! Fantastic news! And Richard Gage Blueprint for Truth is scheduled (tentatively) next? God bless all the good folks at KBDI and Visibility 9/11! Tom Breidenbach on Sat, 07/25/2009 - 11:38am. Put BLUEPRINT on your local Public Access! 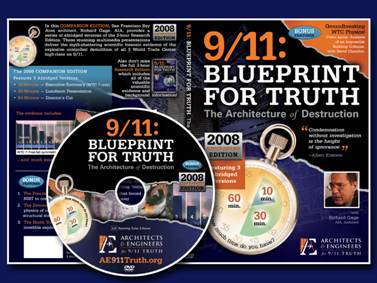 AE911Truth has a special 1 hour broadcast-ready version of "9/11 Blueprint For Truth" that you can put on your own local public access station. DIY.... "Do It Yourself". Get bold! Then follow that up with a letter to the editor of your local paper about the program that was shown on TV that you just saw! RL McGee on Sat, 07/25/2009 - 11:57am. ......to call this damn fine station , and tell them thank you for REAL news! WISDOM on Sat, 07/25/2009 - 7:48pm. This is wonderful news. Thanks to all the folks at KBDI Television and Colorado 911 Visibility. You are true American heroes. ROBinDALLAS on Sat, 07/25/2009 - 11:12pm. Adam1 on Sun, 07/26/2009 - 7:03am. Jon Gold on Sun, 07/26/2009 - 8:09am. Michael on Sun, 07/26/2009 - 9:20am. Jon Gold on Sun, 07/26/2009 - 1:00pm. 9/11 Press For Truth Following the attacks of September 11th, a small group of grieving families waged a tenacious battle against those who sought to bury the truth about the event. This film shows how they took on Washington, compelling lawmakers to launch an investigation that ultimately failed to answer most of their questions. " Yet when I click on the search result, nothing shows up. WTF!? It's only been 8 years so maybe I'm too impatient. wildbill on Sun, 07/26/2009 - 9:32pm. wildbill on Sun, 07/26/2009 - 9:41pm. WOW!....presentation packet for other public stations?!? The BUZZ over Blueprint will be ENORMOUS. a presentation packet for other public stations. Video, stats, press, response, etc. Joe on Sun, 07/26/2009 - 10:44pm. an accurate viewership count, after this is aired? truthoverprofit on Mon, 07/27/2009 - 4:59pm. The updated 2008 version of Blueprint for Truth is currently the #2 video on Google top 100 videos. metallus2 on Mon, 07/27/2009 - 9:18pm. Adam Syed on Mon, 07/27/2009 - 11:50pm. Do you have a link of where Google lists there Top 100 videos? Thanks. Orangutan. on Thu, 07/30/2009 - 8:25am. Orangutan, it should be as simple as going to google.com and clicking on "videos" or via direct link at http://video.google.com. metallus2 on Thu, 07/30/2009 - 11:04am. shadow7 on Tue, 07/28/2009 - 10:41pm.